For me, the highlights of each research year are the Steering & Impact Committee meetings (where we bring together our industrial partners) and the Technical Workshops (where we share our progress between our institutions). On Monday and Tuesday of this week we had our regular end-of-year research extravaganza, where we not only have a Steering & Impact meeting, but the following day our Technical Workshop which we open up to our other close collaborators at Strathclyde, Glasgow and Heriot-Watt universities. This year we met in the beautiful surroundings of Inglewood Manor Hotel, near Chester. Above is a photo, taken on the steps of the hotel, of our industrial partner representatives from Jaguar Land Rover, the European Space Agency, TotalSim Ltd, Waters UK, Nokia Bell Labs (Ireland), TH Collaborative Innovation, and Akzo Nobel Coatings International (not shown). We were able to share with our partners our progress made in the last six months, introduce and hear from our researchers, and discuss mutual opportunities and any issues arising. 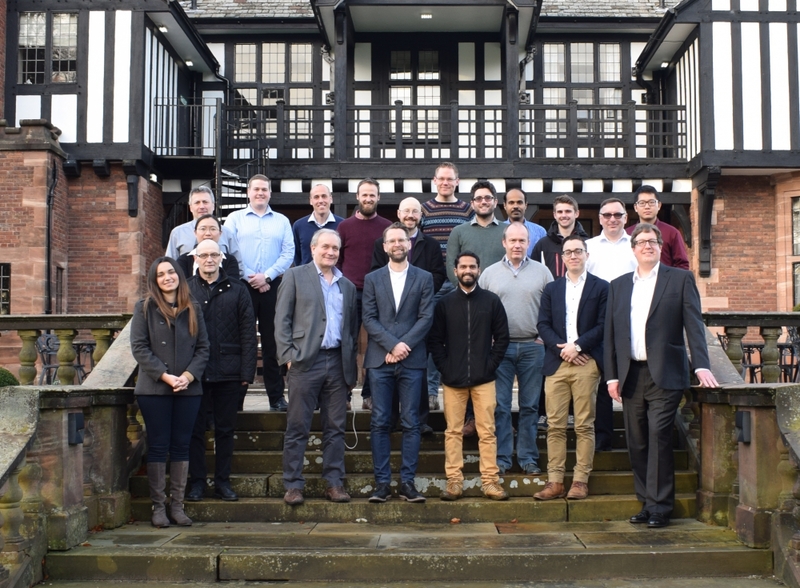 Several of our PhD and postdoc projects have close industrial engagement so we had a lot to discuss, and the contributions of our industrial partners are invaluable! We finished the day with a lively discussion about the UK’s new Industrial Strategy, followed by a convivial meal. On Tuesday we had our Technical Workshop. 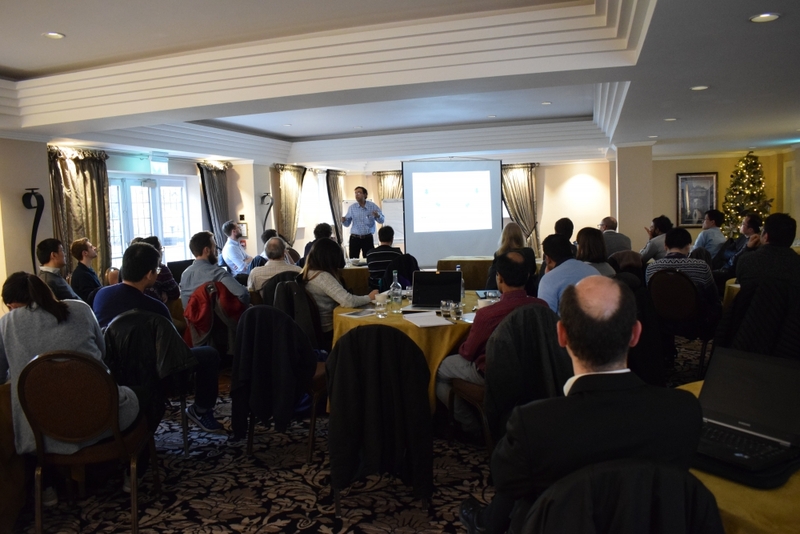 Including our collaborators from Strathclyde University, I counted more than 40 people attending. Trying to fit so many talks from our researchers into the day, meant that we adopted an American Physical Society way of doing it, i.e. talks could only be 11 minutes, with 4 additional minutes for any questions from the audience. The range and quality of the research talks by our researchers always impresses me, and this year was no exception. The excellent research results convinces me that future progress in engineering science is safe in the hands of the next generation! This year we were also pleased to welcome our new visiting scientist Prof Suman Chakraborty of the Indian Institute of Technology Kharagpur, who gave a well-received keynote talk on “Slippery flows: a molecular perspective”. We are looking forward to welcoming Suman back to the UK for another visit to us later in 2018. The day is a fantastic demonstration of the value of working with each other, sharing ideas, and helping each other. I encourage our people to take these opportunities to discuss their ideas, problems, hopes and fears with each other – we have seen time and time again that is the way to advance together. 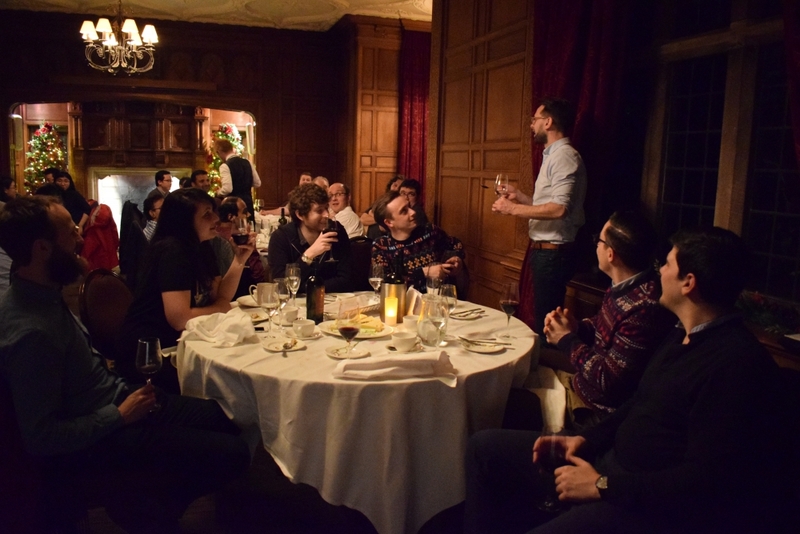 In the evening we gathered for another of our traditions – the end-of-year dinner. This is a great chance to relax together over a good meal, and the evening high-jinks often go on until the early hours of the next morning!